The NEW DAFNI Rose Gold's curved surface allows you to capture more hair in each stroke and is much quicker than traditional straightening hair tongs. The curved surface perfectly complements the curvature of the scalp to achieve maximum efficiency from the root to the ends of the hair. - Step 1 - Ensure your hair is dry. - Step 2 - As you apply the brush, ensure your hair penetrates deep into the bristles. You can do this by moderately stretching the hair with the other hand like you would using a regular iron. - Step 3 - Brush slowly to ensure maximum heat is absorbed into the hair. Straighten from the root to the end of your hair in a slow pulling motion. 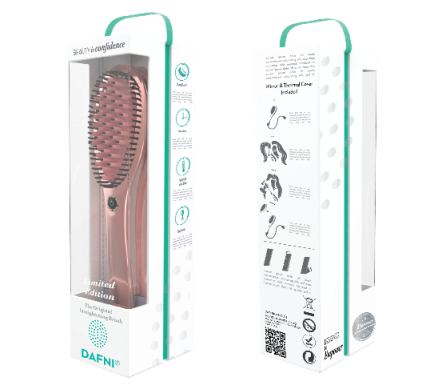 You can use DAFNI on the inner or outer side of your hair. - Tip - Make sure you brush slowly and your hair penetrates deep into the bristles!